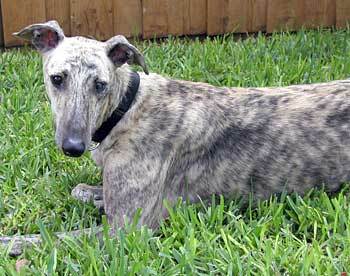 Blazer is a 4-year-old light brindle male, born December 25, 2002. He is the "c" pup in his litter and was not registered. His sire is Gable Chevy, making his grand sire Wigwam Wag, and his dam is Doe Si Doe Snow. Blazer arrived with Tina and Romeo as part of a neglect case monitored by the Lamar County Animal Shelter in Paris. Blazer has one eye that has limited vision due to an old injury, as well as a hygroma on his right haunch, which we hope will get better with some TLC. Blazer is learning the ropes of house living. He has now had a little time to settle in and relax a little. He has gained weight and his coat is getting soft and shiny. He is getting used to life as a pet and likes the attention and to be petted. He still likes to stay in his crate, but he definitely is a roacher! He LOVES to go for walks. His house training has been successful as he has had no accidents in the house and he is fine in his crate during the day while we are at work. Blazer finally noticed the cats. Blazer was standing in his crate and I saw him very slowly move out of the crate, then he got into the hold/focused position and I realized he was focused on our cat. I said very loudly and firmly "No Cats" several times. That certainly got his attention. He started to run from the room but then turned around and ran into his crate and immediately lay down. He looked as if he knew he did wrong. Previously he had not shown much interest in the cats. Every once in a while he looks at them but turns away if I say "No Cats" or turns away on his own. We will continue to keep our eyes on him. I would say he is cat trainable with supervision. Blazer moved to Dallas from Austin a month ago. 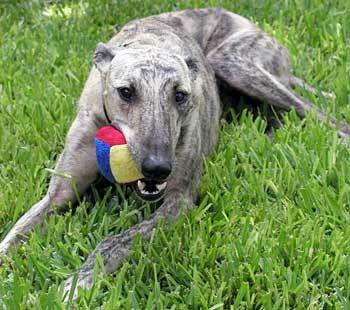 He has been doing very well in this foster home with two other greys (male and female), two cats, and a toddler. It was a bit of an adjustment for him to leave his previous foster home in Austin, where he had been happily living for several months, but his personality is blossoming more and more each day. Blazer started off shy and unsure, but now he's perky and lively. He loves to follow the other dogs around and play, especially with the other male greyhound in the house (his big brother). His favorite activity by far is going for walks. It is a MUST - otherwise he pouts and looks at the door, then at me, then the door, as if to tell me "come on, let's go!" He doesn't have to go far, as long as he gets his daily walk. He does pull a little at first before he settles in and does well with short jogs. He is a "collector" in true greyhound fashion and we've found everything from stuffed animals (the toddler's) to plastic bottles or cups, to socks in his crate. We now play a game of hiding things around the house as trophies for him to find and relocate to his crate. Blazer also loves to play with squeaky toys and he can locate and rip out the squeaker in no time flat. He didn't even blink at our cats when we brought him home, and one of my cats who is a good character judge thought he was just fine from day one (it usually takes her a couple weeks to decide if they're okay). Blazer is potty-trained and likes his crate. He eats a light breakfast in the AM, and after a potty break, he stays in his crate during the day when we're at work (about 8 hours). He does sleep in his crate at night too because it's in the bedroom, but we don't keep the door locked. It's just his little house. Blazer is good with our toddler (14 months) but steers clear of him. Usually when he sees him coming, he just retreats to his crate for a little R&R. I don't let my toddler get too close to any of the dogs out of safety, and as long as Blazer can go elsewhere in the house, he's happy. Blazer is a bit of a Houdini and can open the gate of the chain-link fence easily if the lock is not on. During feeding time, we separate our dogs, and twice I have witnessed him crawling under the fence gate between the front and backyards so after dinnertime he can be with the other two greys. It is amazing watching his 80-pound frame wiggling to fit under a space that is about eight inches high, but he can easily shimmy under there. If I hadn't seen it, I wouldn't have believed it! He is resourceful beyond words, out of survival instinct probably due to his history prior to arriving at GALT. The only time Blazer barks is if he wants inside after feeding time. Otherwise, he's pretty quiet, but not shy about asking for a good rubdown or a scratch, especially behind the ears. He did the "cockroach" at his previous foster home to ask for belly rubs - his favorite! Blazer does have a left eye injury he sustained in his former life. Although he has limited/no vision in that eye, it doesn't stop him from doing anything. He's a little more guarded on that side of his body, especially if he's not sure what you're up to. Occasionally, he will bonk himself going through a door, but otherwise you'd never know. 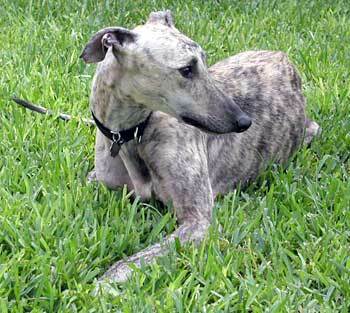 Blazer has a sweet, loving, docile personality and just blends in and goes with the flow. He'd make a perfect dog for any home.